Masdar City, Abu Dhabi’s flagship sustainable urban development, has embarked on the next phase of its sustainable mobility network with the formal unveiling of its first Navya autonomous vehicle. Capable of transporting up to 12 people, the ‘Autonom Shuttle’ was inaugurated in the presence of dignitaries representing the Department of Transport, Abu Dhabi Police, and the French Embassy, said a statement. Also attending were Khaled Al Qubaisi, chief executive officer for Aerospace, Renewables & ICT at Mubadala Investment Company; Mohamed Jameel Al Ramahi, chief executive officer of Masdar (Abu Dhabi Future Energy Company); Mohammed Darwish Al Qamzi, general manager of Integrated Transport Center, Department of Transport in Abu Dhabi; and Jérôme Rigaud, deputy chief executive officer of Navya Group, it said. Designed by the French autonomous vehicle pioneer Navya, the Autonom Shuttle is a self-driving electric vehicle dedicated to first and last-mile transportation. It carries up to 12 people with eight seated, is fully autonomous and has a top operational speed of 25 km per hour. Having successfully completed a rigorous pilot phase, the Navya shuttle will shortly begin a regular all-day service linking Masdar City’s parking areas with its main podium. The service will be the first operational use of the technology in the Middle East and North Africa (Mena). “With urban mobility at the forefront of the sustainability conversation in the UAE and worldwide, and with the business, residential and research community here at Masdar City continuing to flourish, Masdar is building on its legacy as a catalyst for clean-tech innovation to bring cutting-edge and commercially viable autonomous mobility to the streets of Masdar City,” he added. Working closely with Abu Dhabi Department of Transport and Navya Group, the Navya shuttle was customised to mitigate the effects of the Gulf’s extreme heat and humidity on battery performance. Rigorous health and safety testing was also carried out to safeguard passengers and pedestrians. “Today’s launch supports Abu Dhabi’s strategic aim to realize a world-class transportation system for the benefit of both residents and visitors, unlocking in the process further social and economic gains for the emirate of Abu Dhabi and the UAE,” he added. “We are delighted to provide Masdar City with its fully autonomous and smart solutions, providing users with a new way of getting around. 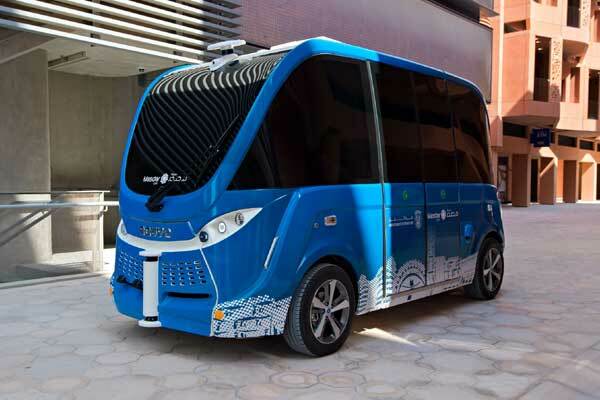 Masdar City is the perfect place to commemorate the first deployment of the Navya Autonom Shuttle in the Middle East and North Africa (Mena) region, where we expect expansion within Masdar City to be broad and decisive in the coming months,” he added.